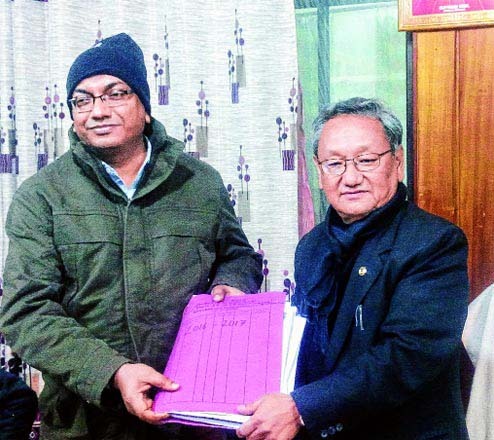 The Gorkha Janmukti Morcha-controlled Darjeeling municipality today laid foundation stone of eight projects worth around Rs 215 crore hours before the civic body's charge was handed over to an administrator. The launch of the projects was a clear indication that the outgoing board did not want others to take credit for the new schemes. Before the foundation stone laying ceremony, the municipality also screened a documentary before councillors and the media to highlight the achievements of the board in the past five years. Immediately after the programme was over in the conference hall of the civic body around 4.15pm today, the outgoing chairman, Amar Singh Rai, handed over the charge to Avik Chatterjee, subdivisional officer (Sadar), who took charge as the administration, following the completion of the five year tenure of the civic body. Rai stopped short of admitting that the projects had been launched to ensure that the new administration did not take credit when they were completed. Asked about the last minute programme, Rai said: "We did not have time to organise this programme earlier." Among the eight projects are the Rs 205 crore water distribution programme which had been sanctioned under the Centre's Atal Mission for Rejuvenation and Urban Transformation project. "The project will be done in phases. E-tenders for procurement of pipes have been floated. The Centre is funding 50 per cent of the project cost, while the state will bear 45 per cent of the expenditure. The municipality will give the remaining funds," said Rai. The Rs 205 crore project is the biggest to be sanctioned to Darjeeling municipality in its 166-year-old history.